If you haven’t read my entry on manual transmissions, you may want to give that a brief glance, as it provides some useful background information on the basic ideas behind an automotive transmission. Some of these basic principles are shared by both automatic and manual transmissions. For example, both use different gear ratios to keep the engine’s output within its ideal RPM range as the car accelerates and decelerates. Unlike a manual transmission, in which the driver selects gears himself, the automatic transmission has only one “drive” setting. As the driver accelerates, the transmission shifts automatically through the different gears. In a manual transmission, a driver selects different gear ratios, i.e. there is a first gear, a second gear, etc. In an automatic transmission, however, all of the gear ratios are produced by an ingenious device called a planetary gearset. However, an automatic transmission uses the same basic gear ratios as a manual transmission. You have first, second, third, and overdrive gears, neutral (engine idles but is disengaged from transmission) and reverse. On rear wheel drives, the transmission is usually mounted at the back of the engine and connected to the wheels by a long driveshaft. In a front wheel drive, the transmission is combined with the final drive to form something called a “transaxle,” mounted under and to the side of the engine. These are two of the most common arrangements, but there are others as well. Planetary Gearset– a collection of gears that can produce a wide array of gear ratios. Hydraulic System and Pump– provide necessary lubrication; activate valves, torque converter, clutches and bands, and other key parts. Computer (newer cars)- takes the place of a range of devices, including valves, governor, modulator, etc. I’ll explain how each of these parts works in greater detail below. This is a beautiful and elegant device; it operates on fairly basic principles but achieves very complex results! 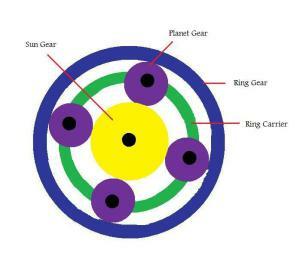 The sun gear sits at the center, which meshes with two or more planet gears that are all attached to the same planet carrier. These gears then meshed with the outer ring gear. All of these gears remain meshed constantly. Locking these gears together in different combinations produces different gear ratios, i.e. different relationships between input speed and output speed. Let’s look at a few examples. 1. Lets’ say that the ring gear = input and the planet carrier = output. We’ll then lock sun gear so that it remains stationary. As the ring gear turns, it causes the planets to “walk” along sun gear. This produces an output that is slower than the input, as you have in first gear. 2. However, say we unlock sun gear and lock it to the ring gear instead. With these two elements locked together, all of the gears will turn at the same speed, so that input speed and output speed are the same. This 1:1 ratio usually occurs in third gear. 3. What about reverse gear? First, lock the planet carrier in place. Then, use the ring gear as input and the sun gear as output. The planet gears will act like the idler gear on a manual transmission, causing input and output gears to spin in different directions. As you can see, the ring gear is used as the input, while the planet carrier is directly connected to the output shaft. However, notice that there are clutch packs connecting the planet carrier to the sun gear, which is connected to a drum containing the pistons that activate these clutches. These clutch packs can be used to lock the planet carrier and sun gear together, so that both spin together and the sun gear becomes, in effect, the output. Next, notice the bands on either side of the sun gear’s drum. These can be used to lock the sun gear in place. These bands are usually made of steel and are activated by a remarkable hydraulic system, which I’ll discuss a bit later. The clutches are activated by pistons, as indicated on the diagram. Hydraulic fluid enters these pistons and activates the clutch; springs cause the clutch to release when pressure is reduced. A real transmission will use two or more planetary gearsets in combination to produce up to eight different speeds. For example, one kind of compound planetary gearset contains one ring gear, which is always the output, but has two sun gears and two sets of planet gears. The input is transferred between the small and large sun gears, while in second gear, for example, the compound gear set behaves as two planetary gear sets, essentially, with the larger sun gear acting as a sort of second ring-gear. The mechanics of it are awesomely complex! All of these gear shifts occur when the car is placed in “drive” or “reverse.” As you know if you drive an automatic transmission, however, there are other settings that one can select with the gear shift lever. Usually, an automatic transmission will have two “low gears.” There is a second gear option, usually marked “2” or “S,” that limits the transmission to the first two gear ratios (or, in some cars, locks it in second gear.) This can be useful when driving on ice or hilly terrain; however, remember that you can’t go too fast in these gears! There is a also a first or “low” gear option, marked “1” or “L.” Like the second gear option, this can be used in difficult driving conditions or when towing a heavy load. Unlike a manual transmission, automatic transmissions also have a “park (P)” gear, in which a small pin or bolt is used to lock the drive wheels in place, preventing the car from moving. When the lever is used to select park, a spring pushes this bolt through a notch on the transmission housing, thereby keeping the transmission—and therefore the wheels—from moving. If the bolt isn’t lined up with a notch when “P” is selected, the transmission turns slightly, until the bolt can fit through a notch. This is why automatic transmissions sometimes roll slightly when the brake is released after parking. Essentially, a very small mechanism is used to lock up the transmission. For this reason, drivers of automatic transmissions should always use the emergency brake (usually a foot brake) in addition to placing the car in park, to avoid placing undue strain on this mechanism, particularly when parked on hills. Like a manual transmission, automatic transmissions also have a “neutral (N)” gear. In this gear, the engine will keep idling, but the wheels won’t turn. This gear isn’t used as frequently on an automatic transmission as on a manual transmission, as in an automatic one can come to a stop in drive without stalling. Instead of a clutch, however, an automatic transmission uses something called a “torque converter” to connect (and disconnect) the engine and the transmission. The turbine provides input to the transmission, while the pump is directly connected to the converter housing, which is in turn fixed to the flywheel, so that housing and pump spin at the speed of the engine’s crankshaft. Both pump and turbine have blades or fins attached, like a fan. As the pump spins, it throws fluid outwards. This fluid, moving in a circular motion, begins to turn the turbine. Because of the configuration of blades within the turbine, the fluid changes its direction of rotation inside the turbine. Once the fluid exits the turbine, it is sucked into the stator. The stator reverses the direction of the fluid and returns it to the pump. This prevents the reversed fluid from slowing down the pump, which would make the torque converter very inefficient. The amount of power, or torque, transferred from engine to transmission depends on how fast the pump is turning. When the engine is turning very slowly, i.e. when the car is idling at a light or stop sign, the turbine will barely turn at all. Because so little power is being transferred to the transmission, it’s easy to keep the car still by keeping one’s foot on the brake pedal. As the pump speeds up, the turbine will slowly start to accelerate, although it will lag behind the pump for awhile. When the turbine’s speed begins to approximate the speed of the pump, then a maximum amount of torque is being transferred. If you think the torque converter is clever, you should see the system devised for activating gear shifts. On newer cars, a computer is used to activate gear shifts. However, automatic transmissions evolved long before the digital age, and older automatics are entirely mechanical. So, how does a mechanical system “know” when to shift gears? This problem is more complex than simply judging the speed of the car. If you read the entry on manual transmissions, you’ll know that lower gears give you more power, allowing you to accelerate faster and to climb steep hills. If you step on the brake pedal hard, the car will stay in a lower gear for longer, in order to provide faster acceleration. However, if you accelerate slowly, the car will shift gears sooner. When more power is required, as on a hill, the transmission will downshift automatically. The “brain” of the transmission is a hydraulic system in which oil is routed through a complex series of metal passageways (the device looks a bit like a computer circuit.) In order to shift correctly, the transmission needs input both on how fast the car is going AND how hard the car is working. The first piece of information comes from the governor. The governor is connected to the transmission output, which in turn determines the speed of the car. As the transmission turns, so does the governor. The governor contains a spring loaded valve and is connected to the hydraulic system. As the governor spins faster, the valve opens more, allowing a greater amount of oil through. The second piece of information—how hard the engine is working—comes from either a throttle valve or a vacuum modulator. 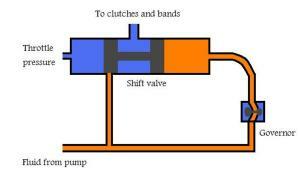 In cars with a throttle valve, a cable connects the valve to the accelerator; the more the accelerator is depressed, the more the valve opens. A vacuum modulator achieves a similar effect. Shift valves provide pressurized oil to the clutches and bands that activate different gears by locking and unlocking components of the planetary gear set. Each shift valve controls one particular shift, i.e. from first to second or second to third. Oil enters each shift valve in three directions: from the governor, from the throttle valve, and from the pump. 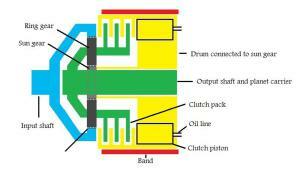 When open, oil flows from the pump to the clutches and bands, causing them to activate. As the car speeds up, the amount of pressure on the right side of the valve builds, as the valve in the governor opens further. When the car is moving fast enough, the shift valve will move to the left, causing a shift to the next higher gear. However, the throttle valve also provides input into this system. If the car is accelerating quickly, the throttle pressure will be higher, counteracting the pressure from the governor. This means that the car has to be moving faster in order for the shift to occur. The reverse occurs when you accelerate slowly. The operation of each shift valve is triggered by the amount of pressure coming from the governor, so that particular ranges of pressure correspond to the operation of the first-second valve, second-third valve, etc. These complex interchanges are controlled by the valve body, a piece of metal with passageways molded into it, like a computer circuit. These passageways channel fluid to the appropriate valves. The manual valve is a kind of “master valve” connected to the shift lever. When different gears are engaged, the manual valve feeds the appropriate circuits. For example, if you shift into “2,” the manual valve will feed shift circuits for the first two gears but inhibit the others. On computer-controlled transmissions, electric solenoids are used to direct fluid to the appropriate valves. As I’ve mentioned above, an automatic transmission relies on a complex and extensive hydraulic system. In fact, an average automatic transmission will contain up to ten quarts of oil! Pressurized oil is used to lubricate the moving parts in the transmission, power the bands and clutches, activate shifts, power the torque converter, and cool the entire system. For this last purpose, the oil cycles through a chamber submerged in the antifreeze, in order to remove excess heat. The automatic transmission’s pump also plays a crucial role in making sure that all parts are supplied with the necessary pressurized fluid. All in all, automatic transmissions are a mechanical marvel! To read more on a broad range of subjects from “How To Change A Tire” to “How To Jumpstart Your Car”, visit DefensiveDriving.com’s Safe Driver Resources website! Visit our state-specific sites for more information about online defensive driving in Texas, California, Florida, and New Jersey.